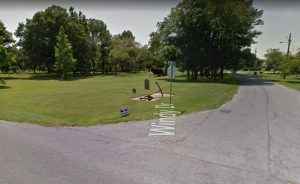 There is only one known marked grave in Ocean City, located just before the terminus of the Route 50 bridge in West OC. The grave resides within the boundaries of a housing development on Golf Course Road, Captain’s Hill. There are no cemeteries or even another lone marked tombstone in Ocean City; burying the deceased in a coastal area has long been an unsound idea since shorelines are known to erode, and the grounds of Ocean City have never been conducive to a proper, respective burial. In fact, coastal cemeteries have been known to literally fall into the sea. Historically, most of Ocean City’s deceased have been buried in Berlin, MD, or elsewhere. Next to the tombstone is a smaller footstone engraved with the Captain’s initials, W.C. There’s also a large, rusted anchor that sits on concrete embedded into the ground just a few feet away. The site of Captain William Carhart’s grave in West Ocean City. Carhart was from Philadelphia, PA. A “Camphene Club of Philadelphia” would reportedly visit the gravesite in the late 19th century, where a German band would then play songs of mourning and barrels of beer would be poured out in the late Captain’s (or possibly a different late unknown sailor’s) honor, according to an unofficial account from the Democratic Messenger in 1955. The tombstone was once hidden away under the cover of trees, before the houses at Captain’s Hill were built. In 1991, Suzanne Hurley, the late curator and historian of the Ocean City Life-Saving Station Museum, compiled a feature story of three articles that documented the legend and lore of Captain Carhart in Ocean City, which includes the account from the Democratic Messenger. Another article, by Gerald W. Johnson for the Evening Sun Paper in September of 1932, described the area of the burial site before all the development, back when the neighboring golf course was the nearest sign of life and golfers would occasionally stumble upon the grave when they teed off with a little too much venom. Captain Bunting claimed that a drowned Carhart washed ashore in Ocean City after the ship wrecked, that the sailor was initially buried on the beach but “they got to figuring that if a high tide came and uncovered him they’d be in a bad fix, because he would come back and haunt ’em,” which is how he ended up buried in the woods of what is now Captain’s Hill. The stories and legends surrounding Captain Carhart, his crew, and the shipwreck all differ in myriad ways. Even the date of the shipwreck, inscribed onto the tombstone, has been reported differently in oral tradition and in publication. In “Footnotes to a Legend” by shipwreck researcher Joan D. Charles, Charles reported an article she discovered in the Philadelphia Daily Advertiser dated Jan. 21, 1799, which stated that Carhart’s ship was the Hawk, not the Ocean Bird as previously believed, and it had been transporting a cargo of mostly sugar. The ship left from Havana, Cuba on Christmas day of 1798, and had likely been traveling back to Philadelphia before it was stranded. Another question that I haven’t yet found the answer to is, is there even really a body underneath that tombstone? Regardless, a visit to Carthart’s grave makes for an interesting if slightly spooky pitstop on the way to the beach. 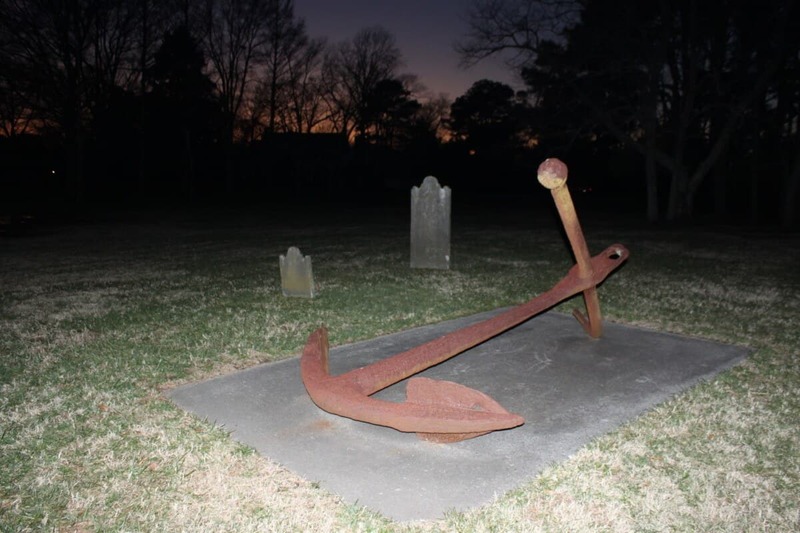 It certainly serves as a reminder of Ocean City’s long and rich maritime history, even if questions and mysteries still hang in the air surrounding one of the town’s most well-known, though not most initially well-documented, shipwrecks. Just be respectful of the dead, and of the living residents of Captain’s Hill.